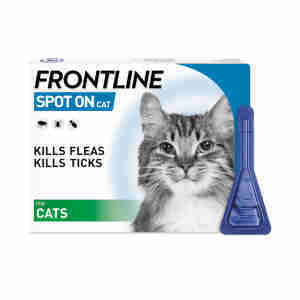 Frontline Spot On for Cats protects your cat from fleas and ticks. It can be used to treat a current infestation and as a preventative. Simply place the tip of the pipette on the skin in front of the shoulder blades and squeeze the pipette gently to empty the contents. The treatment continues to protect your pet and kills new fleas within 24 hours for up to 5 weeks. You've found an Easter egg. Use code MAEGG15 at checkout to get 15% off your order. Be quick, though: the codes can only be used a limited number of times. Fipronil: 10% w/v,Butylhydroxyanisole E320: 0.02% w/v , Butylhydroxytoluene E321: 0.01% w/v,Non-aqueous vehicle: to 100%. Do not use on cats under 8 weeks old or less than 1kg. Protect your cat from fleas by administering Frontline Spot On every 4 weeks. It is recommended to treat the home environment with a household flea spray which contains an insect growth regulator, such as Staykill Household Flea Spray or R.I.P Fleas Spray. Treating the environment once every 6-12 months will help reduce the risk of a home infestation. Use 1 pipette of 0.5 ml per cat (approximately 7.5 - 15 mg/kg). No stress for me or the pets. Very good price too. Excellent service. Best products in my experience. Fair price. Speedy .